Today is the winter solstice, the shortest day and the longest night of the year in the UK. For a moment the Earth tilts furthest away from the sun in the northern hemisphere, before it turns back towards the light. My pagan friends celebrate the winter solstice, Yule, by lighting candles to mark the sun’s rebirth. While it is a long time till spring from this point on we can all welcome back the lengthening of days. In beekeeping traditions the darkest day of winter is a point of stillness inside the hive. 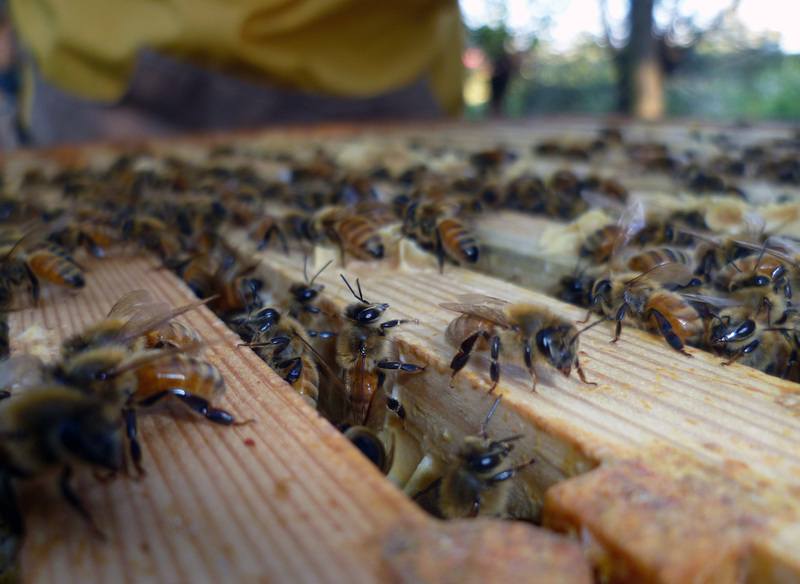 The queen has stopped laying and the workers cluster around her in a broodless nest. 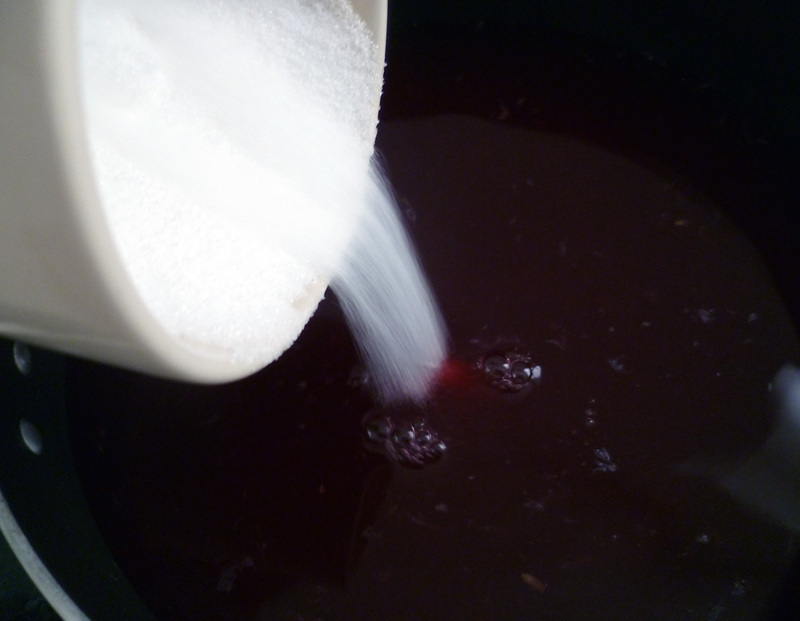 A perfect time to give the bees a solstice stocking filler of warmed oxalic acid in syrup. Yesterday was bright, cold and dry at the apiary. The beekeepers were feeling festive as they ate mince pies and drank home-brewed beer. Everyone was soon very merry! Elsa helped us to warm the oxalic acid that we were giving to the bees by standing the bottles in an upturned lid of a teapot. As we marvelled at her practicality, she said in her gentle Australian accent, “I wasn’t a Girl Scout, but I was raised in the bush”. The sun was dropping fast through the trees and the mince pies had all been eaten. It was time to give the bees their stocking filler. 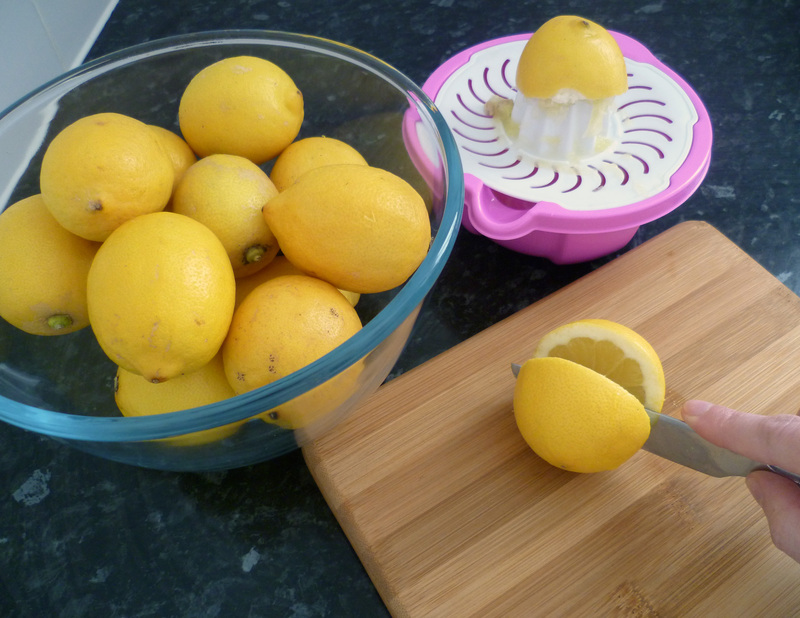 I’ve blogged about giving the bees oxalic acid before, this year two beginners gave it to the hives. They will make excellent beekeepers. The oxalic acid is meant to burn the mouths and feet of varroa mites feeding on adult bees, so they drop off. It is given in midwinter when the colony is thought to be almost broodless and the varroa mites have fewer places to hide. 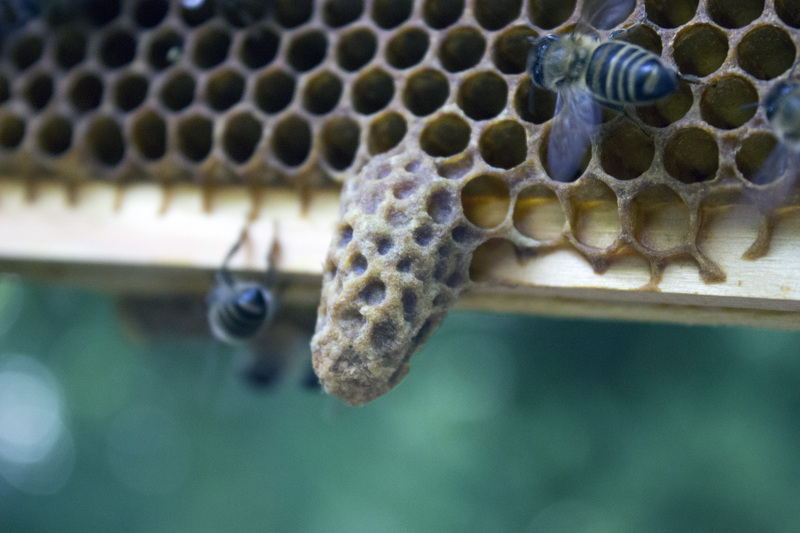 Some beekeepers now check their hives for brood a few days before giving the oxalic acid following last year’s findings by Laboratory of Apiculture and Social Insects (LASI), which caused something of a stir among beekeepers. The research suggests any time between 10th December and Christmas is a good time for oxalic acid treatment and that you check for sealed brood, and destroy it, around two days before. I hadn’t forgotten the advice but we didn’t do this. I could tell by looking at the way the bees were moving around and over the frames that there is likely to be sealed brood inside the hives. Perhaps it is a knock-on effect of a longer brooding season due to a milder autumn and winter? What effect that will have on the oxalic acid treatment, I don’t know. Even so, all’s looking well inside the four hives. Chili’s bees were playful, Melissa’s bees were peaceful, Chamomile’s were curious (a good sign) and Pepper’s were spirited! This is my last post of the year as I take a break for Christmas. So, as an aromatherapy beekeeper, I’ll leave you with a picture of the apiary on the darkest day in winter and a stocking filler from the bees – a home-made honey-and-lavender lip balm that you can make quite easily. The recipe is in the Postnotes below, along with more details about The Queen’s Garden. All that remains to be said is a Very Happy Christmas bees, humans and everyone! Pour the warm balm into small pots and leave to set, then lid and label your honey-and-lavender lip balm. Of course, the lip balm is meant as a gift – you can’t sell home-made cosmetics without special safety requirements. As an added precaution too, skip the lavender oil if you are pregnant. Aromatherapy texts differ on which essential oils to use in pregnancy and at which stage of pregnancy, and the proper advice is actually a lot more involved than this. 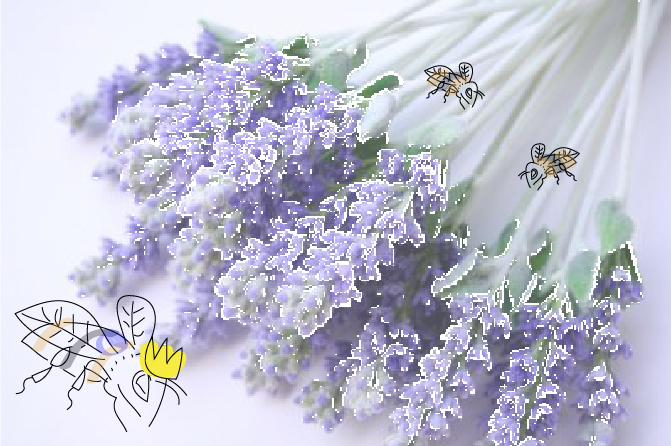 I’m not going into that now, so skip the lavender to be on the safe side – the balm really is as nice just as honey and beeswax. 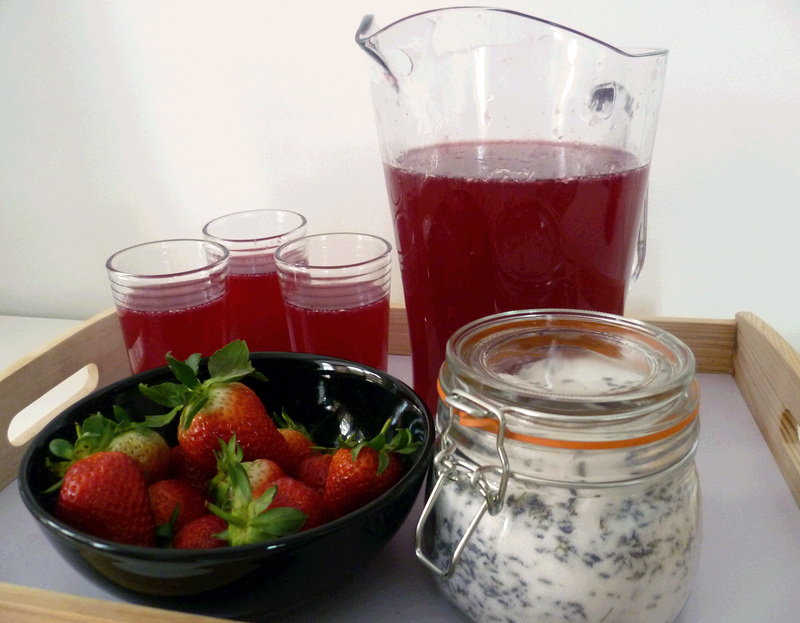 The recipe is also posted on the Ealing and District Beekeepers’ website which I run, as a news item along with a link to the recent Bee Craft live episode on using hive products. Don’t forget to watch The Queen’s Garden on Christmas Day! 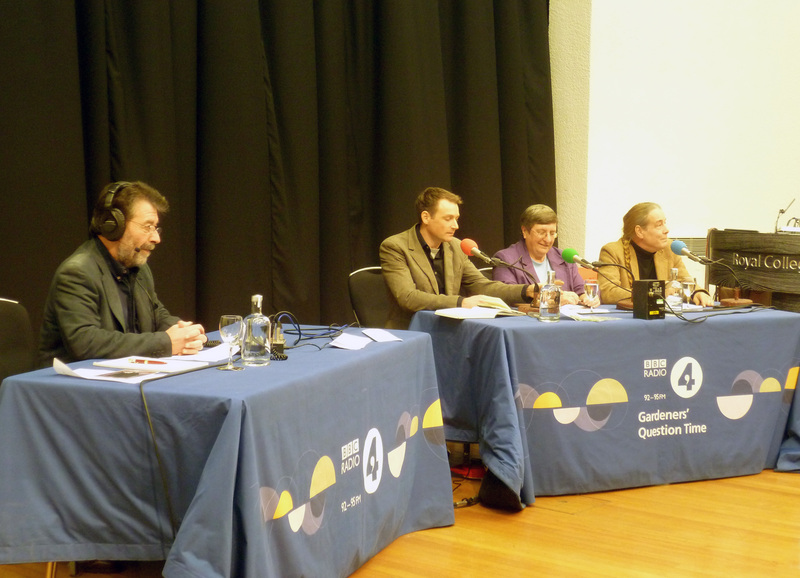 Elsa is sure from a preview that you’ll at least see John Chapple, the Queen’s Beekeeper, pull a frame from a hive! Download a free ebook stocking filler here, a Christmas gift from me and the bees. The Queen’s Diamond Jubilee brought street parties with red, white and blue bunting this weekend to mark 60 years of HRH. As the queen is an honorary fellow of the Royal College of Physicians where I work, we celebrated Jubilee Day last week and held a charity cake sale with all the proceeds going towards the Prince’s Trust. There was traditional English food on offer in the buttery including roast beef and Yorkshire pudding. 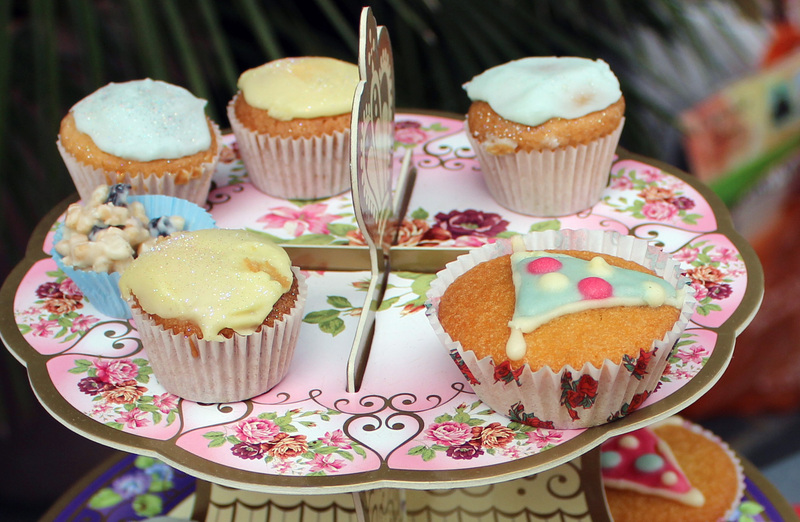 At the apiary on Saturday there was also lots of cake, which is not that unusual. 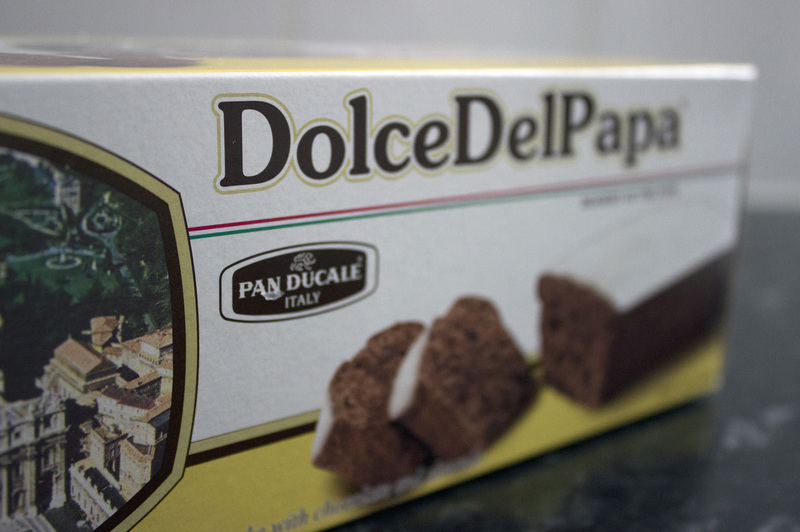 I had brought a cake from my holiday in Rome called ‘Dolce del Papa’, or ‘Dessert of the Pope’, which I was bemused to see John Chapple, the queen’s beekeeper, eyeing a bit suspiciously before taking a slice. 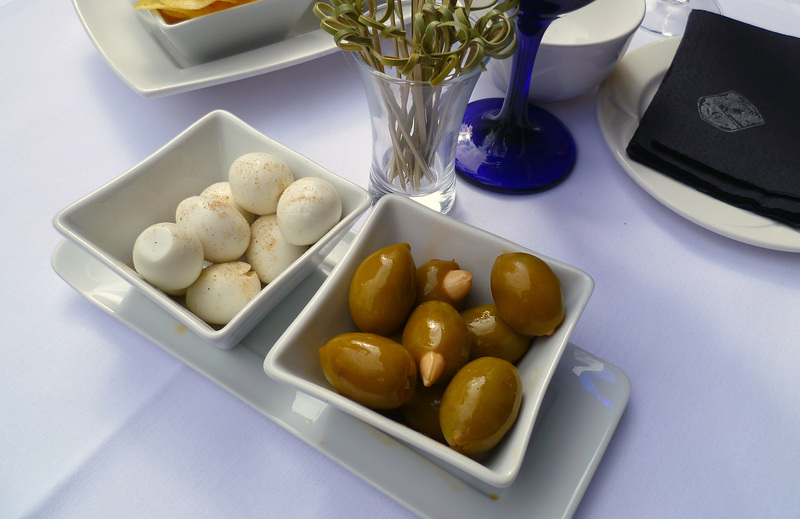 Dessert of the pope – it’s heavenly delightful! Emily and me had our own queen to celebrate – a beautiful bright orange virgin which had been spotted by Emily in our swarmed hive while I was in Italy. To our delight, the queen’s enlarged abdomen indicated that she had mated and she was happily running round the comb being attended by her revenue of ladies-in-waiting. Queen Neroli, our bright orange Diamond Jubilee queen! Emily thinks her mother, Lavender, mated with New Zealand drones, which would explain why our new queen is very orange. We have decided to call her Neroli, which is the oil obtained from the blossom of the bitter orange tree. The essential oil (Citrus aurantium var. amara) takes its name from the 17th-century Italian princess of Nerola, Anna Maria de La Tremoille, who famously wore the oil to scent her gloves. A royal name fitting for a queen bee who took her crown on the Diamond Jubilee. Salvatore Battaglia says the aroma of neroli is light, refreshing and floral, citing Valerie Worwood’s The fragrant mind which describes the essential oil to be ‘ageless, forever young in a spring-like way’. Emily and me hope Queen Neroli will live long and bring good fortune to her hive. A queen cell from our swarmed hive placed in Myrrh’s dwindling colony has not produced an heir. Sadly, Myrrh’s old hive remained queenless. The queen cell that I had placed in the colony from our swarmed hive two weeks ago was still capped. Queen bees usually emerge eight days after the queen cell is sealed, so it seemed unlikely that the larva had survived this long. John suggested uncapping the cell to be certain and showed us how to do this gently with a hive tool. 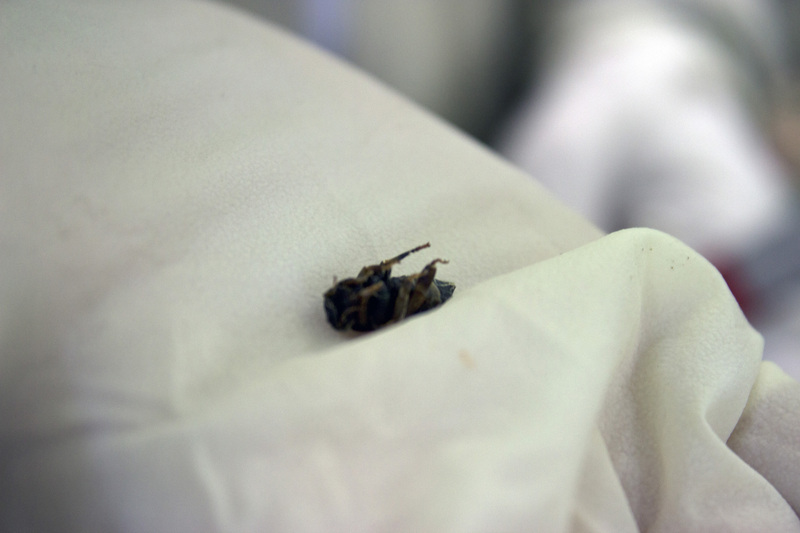 If the queen was alive then this would allow her to emerge – but the uncapped cell revealed a shrivelled, blackened, dead queen bee inside the cell. John thought she may have died from black queen cell virus. A blackened and shrivelled dead queen which may have died from black queen cell virus, associated with the hive disease nosema. 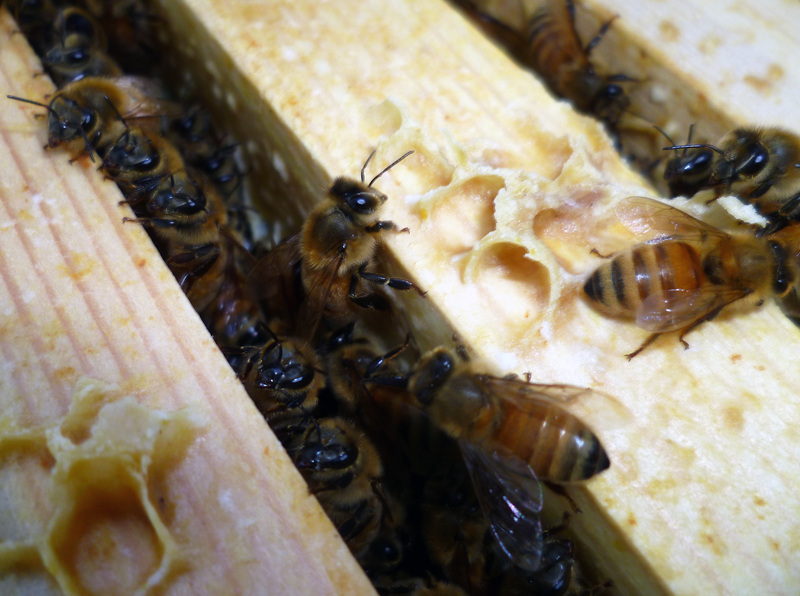 This hive has been unlucky with queens – a drone-laying queen after winter, an unmated queen in spring due to bad weather, and two failed attempts to re-queen using frames of larvae and finally a queen cell from Lavender’s hive. This latest bit of bad luck – a dead queen in her cell – decided the colony’s fate. Emily and me had given these bees enough chances, it was time to combine our two hives. 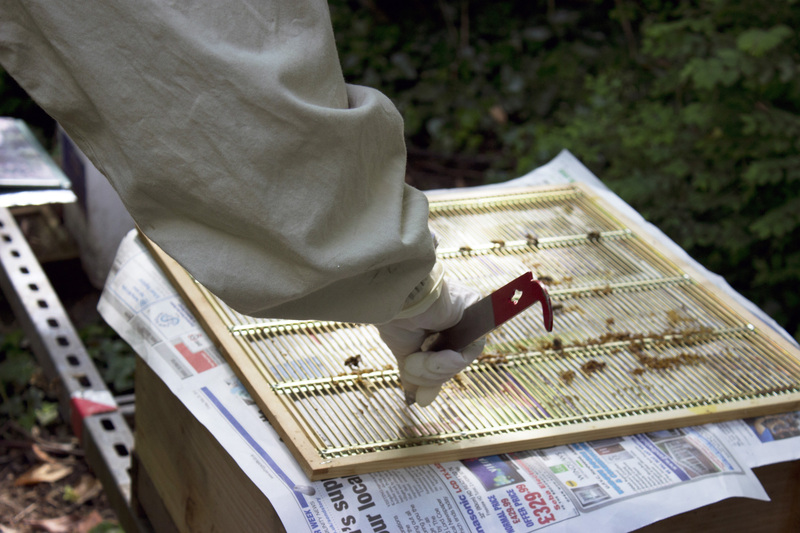 A sheet of newspaper is placed on top of the brood box which has the queen in the nest, and a hive tool is used to make a few small holes through the queen excluder as Emily demonstrates here. The brood box of bees without a queen is placed on top. During the week, the bees will chew away the newspaper, which will give them time to become accustomed to each other’s smell and prevent fighting – they will be the best of friends. At least, that’s the plan. Hopefully, next week we will return to our newly combined hive and our girls should all be getting along! 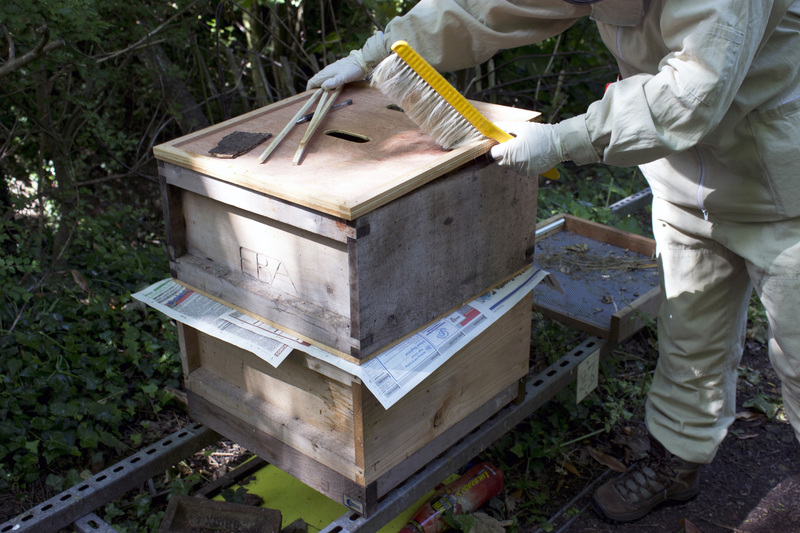 John explained that hive combining should be done in the evening or early morning when the foragers are inside the hive. 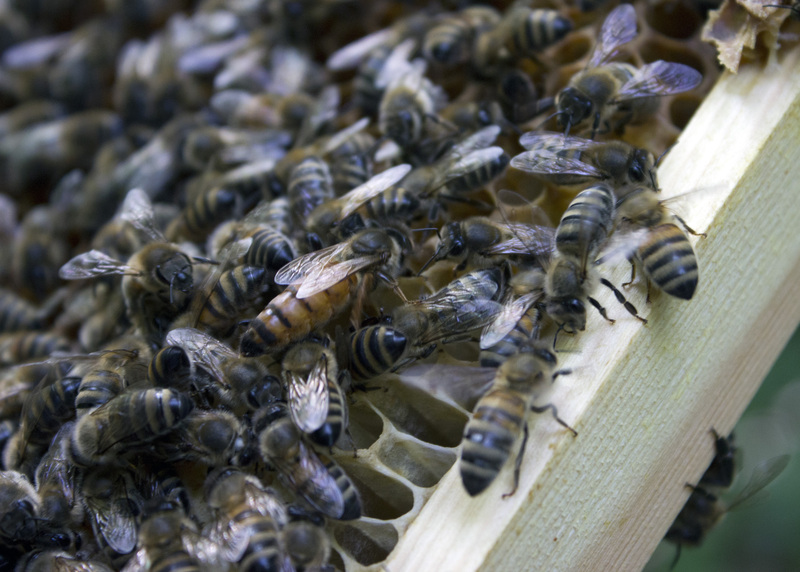 This is because moving a hive – even by an inch – can cause foragers to lose their way home. However, as it was already late in the afternoon he thought it should be fine. Emily and me waited as long as possible for Myrrh’s foragers to return and circle the area where their old hive had been. When they settled on the mesh floor we carried and brushed the bees into the combined hive, but we could not get them all. Eventually the circle of returning foragers disappeared and we hoped that they had bribed their way into other hives with their loads of nectar and pollen. 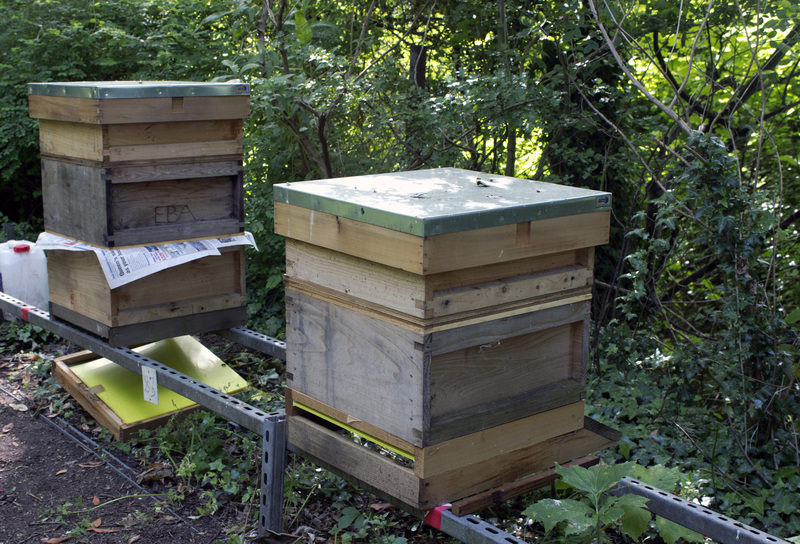 Our newly combined hives – and what is this mysterious empty hive next door? 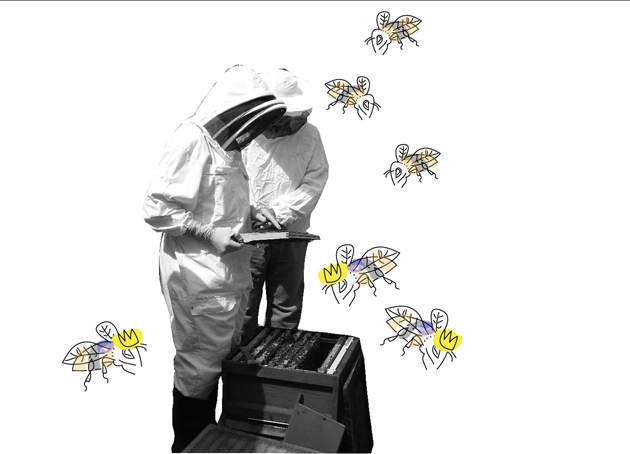 It seemed that we were down one hive, but John and Pat were busy scheming. In April Emily and me had helped John set up nucleus hives at Osterley Park and the nucs were now ready to bring to Perivale apiary. ‘Would you like another colony?’ Pat asked, to which we both replied ‘Yes!’. So before we left for the day, we used our spare woodwork to set up a new hive next door to Neroli’s. We reflected that both our hives were now in the sunniest spot of the apiary, which should help them to flourish before summer ends. In honour of our new queen, Neroli, and her royal mother and grandmother, Lavender and Rose, here is a hauntingly beautiful essential oil blend that can be used for a rejuvenating facial massage or for an anti-aging and nourishing night oil. 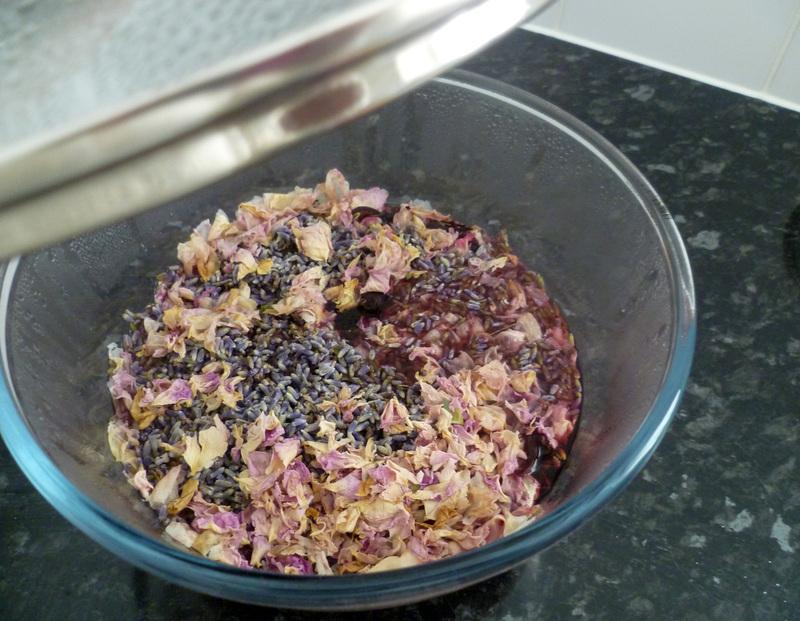 As with all aromatherapy blends, remember to patch test before general use and don’t use during pregnancy without advice from your midwife or doctor. The official website of the Queen’s Diamond Jubilee, where you can also send a message to the queen. Your lavender friend is kind and understanding. She instinctively knows how you feel and she is ready to give a friendly smile and a comforting hug when you need one. 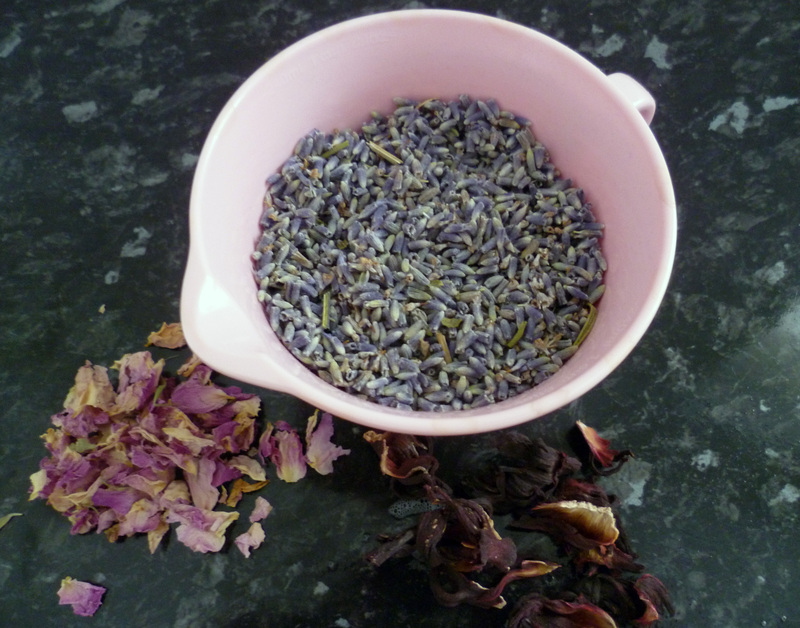 I became a professional aromatherapist in 2005 after completing my diploma in Aromatherapy and Essential Oil Science with Neal’s Yard Remedies Ltd in Covent Garden, London. I studied hard to learn about the essential oils, carrier oils, anatomy and physiology, massage, beauty treatments, therapeutic relationships, and the history of natural medicine. My studies included profiling over 70 essential oils, such as their chemistry and actions. This was my first post on my first blog about living with essential oils, which I have now revived here. 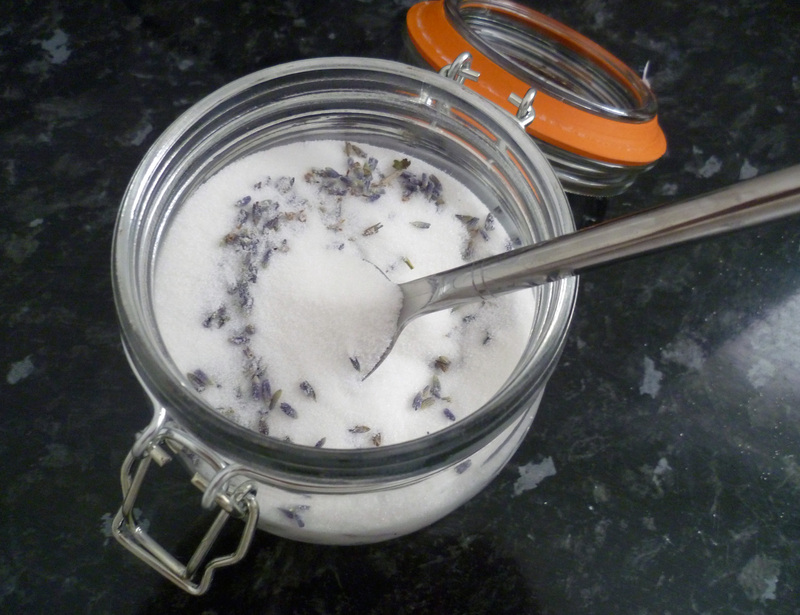 Lavender is one of the most commonly used essential oils in aromatherapy. The herb has been popular since ancient times, it is a valued and versatile healer that restores balance to the body and mind. 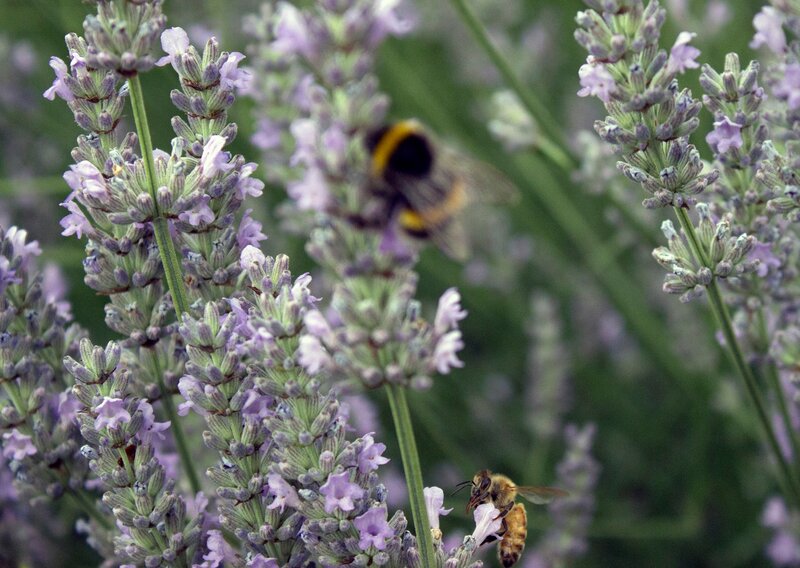 The 17th-century English herbalist, physician and astrologer Nicholas Culpeper (1616–54) described lavender as “being an inhabitant almost in every garden, it is so well known that it needs no description”. He assigned planetary rulership of lavender to the quick-witted messenger of the Roman gods, Mercury, because the herb helped to soothe headaches and aided sleep, yet stimulated the mind. It is lavender’s ability to both revive and calm, to balance most physical and emotional states, which makes it so widely used in aromatherapy. There are different types of lavender. 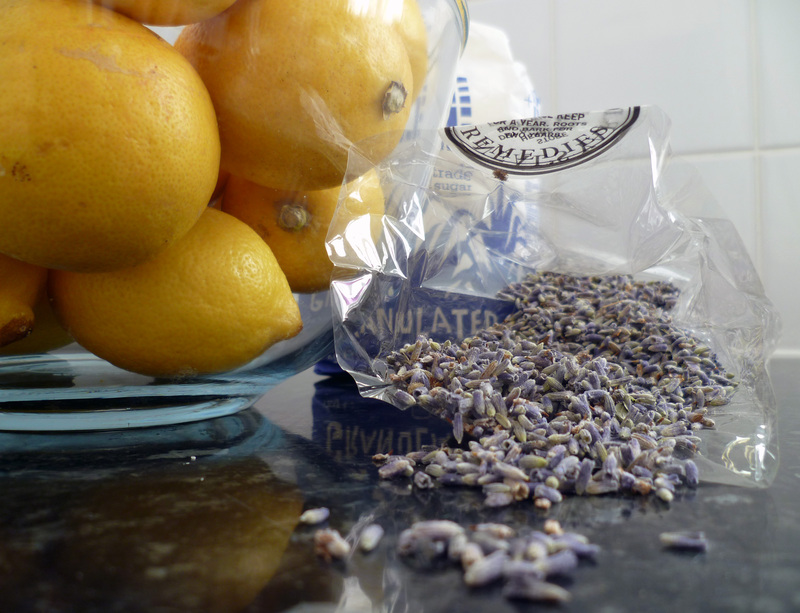 The essential oil that I lived with, and which is described here, is known as true lavender (Lavandula angustifolia). It has a distinctive yet subtle aroma, being sweetly floral and herbaceous. Its lance-shaped leaves with spears of purple flowers are familiar in most gardens. Press the flower head or leaf between your fingers, rub gently and lift your hand to smell the beautiful fragrance. 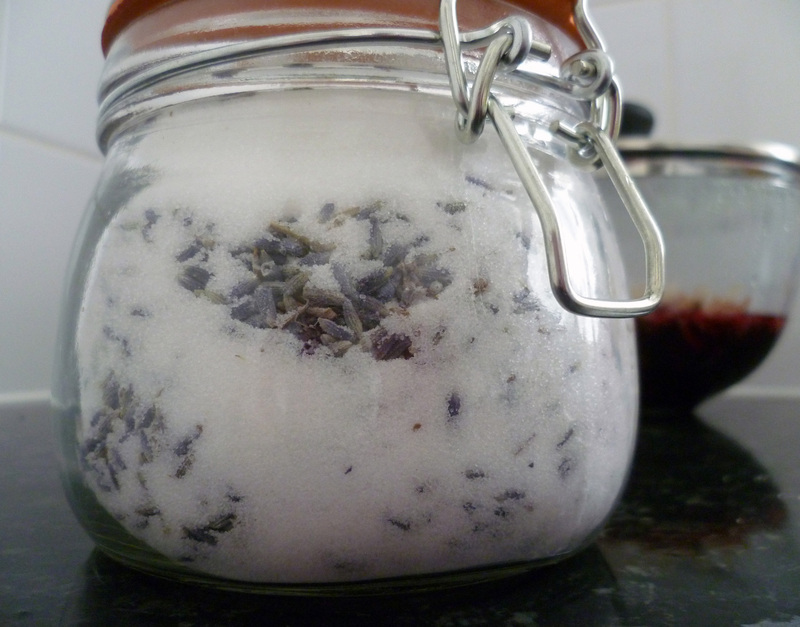 Lavender is widely known as the oil which started modern aromatherapy. The story of the French chemist René-Maurice Gattefossé (1881–1950) who discovered the oil’s healing properties in a laboratory accident is mentioned in almost every book about aromatherapy. Gattefossé burned his hand and accidentally immersed it in lavender oil, but then found that the oil eased his pain and helped the skin to heal faster without leaving a scar. It is a popular account of the revival of aromatherapy, although I’m not personally saying that burns and scalds are treated other than medically advised. Still, I always keep a bottle of lavender oil in my cupboard. It is a kitchen staple because of its usefulness in treating so many ailments: spots, acne, eczema, minor skin infections, insect bites, inflammation, aching muscles, and so on. I find that it is a gentle-acting oil, but effective, and so suitable for most people to use. I used lavender essential oil to care for my skin this week. A blend of 15 drops lavender oil and 15 drops geranium oil to 30ml olive oil in a dark glass bottle to use as a skin cleanser. The blend gently and effectively removed all traces of make up from my face, although, of course, I didn’t use the oil to remove eye make-up. To use an oil-based cleanser like this, pour a teaspoonful amount onto the palm of your hand and massage on your face for a few minutes. Wipe off using a hot damp cotton cloth, and repeat. The first cleanse lifts off the grime of the day, while the second cleanse removes deep-down dirt and debris clogging up pores. Adding lavender oil to my evening skin-care ritual helps to relax my mind and brings harmony to my thoughts at the end of a hectic day. After a long hard week, I used lavender oil for a comforting bath. While the bath water ran, I blended 10 drops of lavender oil with 10ml full-fat milk; skimmed milk is no good as the essential oil needs to bind with the fat to blend. 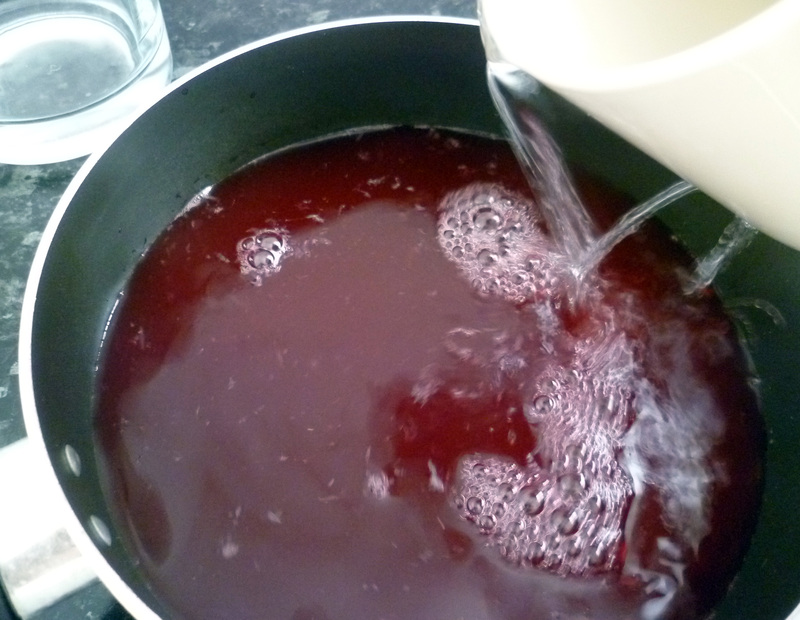 When my bath was run, I poured in the whole blend and sloshed around thoroughly. I felt like Cleopatra bathing in my creamy lavender bath as the fragrance restored inner peace. Finally, for a good night’s sleep and to awake feeling refreshed, I poured three to four drops of lavender oil on the corner of my pillow to drift naturally into sleep. I love to read about the myths and legends of plants and flowers, exploring the wisdom traditions in which they were once used. In Ancient Greece, lavender was a herb of Hecate, the goddess of witchcraft, and in pagan traditions it belonged to the Willow Moon which shone between 15 April to 12 May. 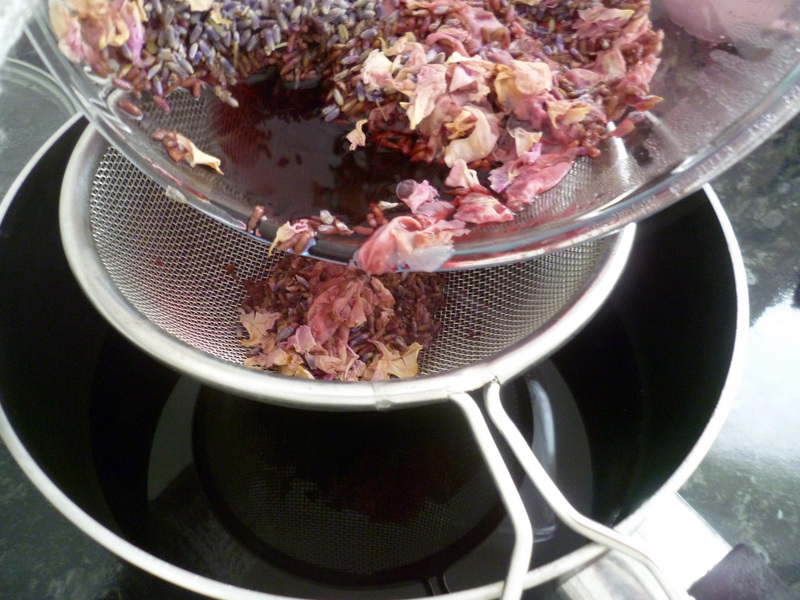 I remember a herbalist telling me how lavender wine was once drunk to help cure flatulence or colic. The herb was also thought to prevent fainting spells when mixed with fennel, cinnamon, horehound and asparagus root. 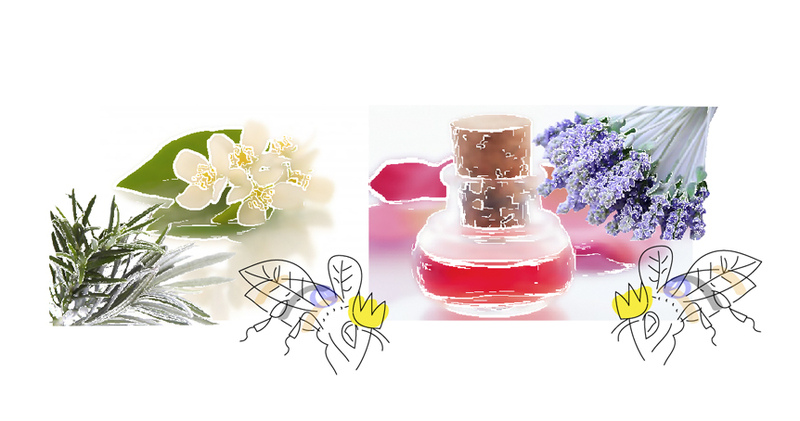 This post is dedicated to my grandmother, Antonie Ursula Dees, who introduced me to aromatherapy and a world of fragrances. Further reading: This profile is based on my diploma studies, knowledge and experience of using this essential oil. Other aromatherapy texts will list a wider range of properties and uses. Some of the most comprehensive essential oil profiles that I have read are published in Salvatore Battaglia’s The Complete Guide to Aromatherapy, Second Edition, Perfect Potion, 2003, Australia. ISBN: 0-6464-2896-9.